The throat comprises of air and food passageways lying behind the nasal cavity and mouth and in the neck. It consists (from the top to the bottom) of the pharynx, epiglottis, larynx (voice box with vocal cords) and the upper part of the esophagus and trachea (Picture 1). The pharynx is a muscular tube lying behind the nasal cavity and mouth, carrying air from the nose toward the larynx and food from the mouth toward the esophagus. The pharynx is what your doctor can see through your mouth when examining your throat. The epiglottis is a muscular fold that covers the entrance of the larynx during swallowing, thus preventing food from entering the lungs. The larynx (voice box) is a tube made of muscles and cartilages and carrying air from the nose and throat toward the trachea. The trachea (windpipe) is a tube made of muscles and cartilages, carrying air from the larynx to bronchi. The esophagus is a muscular tube carrying food from the pharynx toward the stomach. The pharynx (Greek pharynx = throat; pharanx = gulf, chasm) is a cavity within the throat that serves as an air and food passage. The other main part of the throat is the larynx. When food or fluid enters the pharynx, muscle contraction — swallowing reflex — pushes it toward the esophagus. Disorders of swallowing — dysphagia — can be caused by dry mucous membrane, dry food, disorders in the pharyngeal wall, psychological reasons or neurological disorders. Touching of the soft palate or the back wall of the pharynx with the finger can trigger vomiting reflex. Pharynx carries air from the nose and mouth toward the larynx. Inflamed adenoids or tonsils, sudden swelling from an insect bite or allergic reaction, stuck food or detached dentures, or injury of the pharynx can all impede breathing. 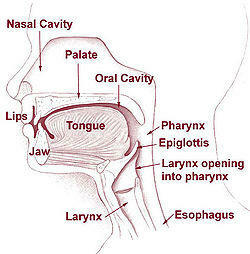 Pharynx, together with the larynx, tongue and soft palate, helps to form sounds. The pharynx is connected with the middle ear on both sides with Eustachian tubes (Picture 1). These enable equilibration of pressure differences between the throat and the middle ear built during quick changes of altitude, diving or in disorders of the middle ear. Tonsils and (in children) adenoids (Picture 1) can catch some microbes and foreign particles thus preventing them to enter the lungs. Pharynx is a vertical tube lying behind the nasal and oral cavity. Its walls are built from striated (voluntary) muscles, covered by mucosal layer on its inner side. The part of the pharynx lying behind the nasal cavity is called the nasopharynx (Lat. nasus = nose). In children, a mass of lymphatic tissue — the pharyngeal tonsil or adenoids — is protruding into the nasopharynx from its roof. Above the pharynx roof, the sphenoidal sinus — one of the paranasal sinuses — is located. The part of the pharynx seen through the mouth is called the oropharynx (Lat. os, or- = mouth). The lingula is hanging down from its frontal edge. There is one tonsil located on each side. Normal tonsils can be small and not visible or quite prominent when checked in a mirror (Picture 2). Symmetrically enlarged and reddened tonsils are seen in acute inflammation; in chronic inflammation, tonsils can be shrunk. From asymmetric tonsils or lingula pharyngeal a pharyngeal cancer can be suspected. Picture 2: Oral part of the pharynx as seen through the mouth. The bottom part of the pharynx, lying behind the larynx is called the laryngopharynx. The back part of the pharynx continues downward into the esophagus, and its front part into the larynx. 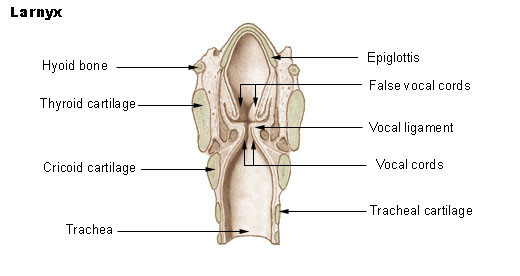 During swallowing, the entrance of the larynx is covered by a muscular fold – epiglottis. The larynx (from Gk. larynx = the upper windpipe) is an air passage carrying air from the pharynx to the trachea (Picture 1). 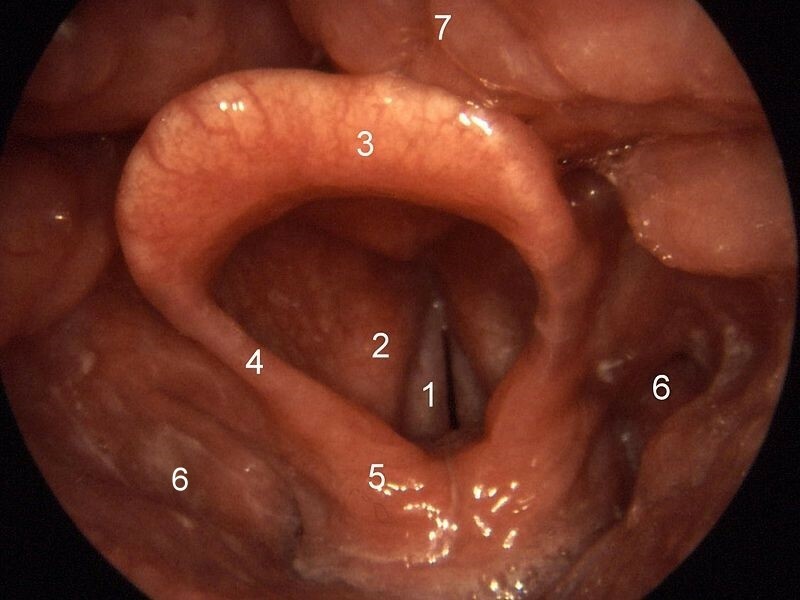 It contains the vocal cords (folds), also called the voice box. The adjective form of larynx is laryngeal, for example, laryngeal cancer. Larynx is a short (1.5 inch) tube lying in the front middle part of the neck, between the pharynx above and the trachea below. It extends from the upper edge of the thyroid cartilage (laryngeal prominence – Adam’s apple) to the bottom edge of the cricoid cartilage. In skinny persons, both cartilages can be felt by fingers. The thyroid cartilage is connected to the hyoid bone by muscles. Larynx lies on the C3-C6 level of the cervical spine. Behind the larynx, there is a lower part of the pharynx and the neck part of the esophagus. Two arytenoid cartilages, attached to the vocal cords. A thyrocricoid membrane connects the thyroid and cricoid cartilage. A cleft can be made into this membrane to enable breathing in emergency situations, when foreign objects or swelling of epiglottis from severe infection or allergic reaction obstructs the entrance of the larynx. A pocket knife can be used to make a cleft through the skin and membrane, and a thin tube, like the chase of a biro pencil, should be put into the cleft to maintain air flow. All laryngeal muscles are voluntary striated muscles. They are innervated by a left and right Superior laryngeal nerve and Recurrent laryngeal nerve (branches of the Vagus nerve- 10th cranial nerve). These nerves also enable sensations in the larynx mucosa. Intrinsic (internal) laryngeal muscles alter the position, tension and shape of the vocal cords. 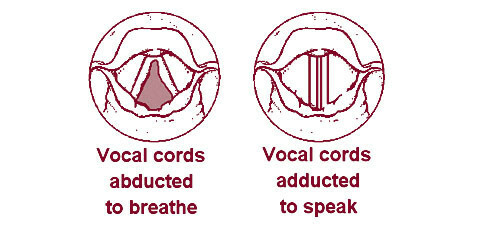 They keep vocal cords apart during breathing and together during speaking (Picture 3). Extrinsic (external) laryngeal musclesattach the larynx to the hyoid bone and other neck and head structures, and enable larynx elevation during swallowing and speaking (1). Your primary doctor can examine your larynx with the help of a small mirror held on the back of your throat (Picture 4). Your doctor for ear, nose and throat (ENT) can use laryngoscope to make a detailed investigation of the larynx and take samples (biopsy) of laryngeal mucosa. Histological changes of a sample can be then checked under the microscope. CT or MRI can be use to detect disorders in the laryngeal wall or adjacent structures. Acute laryngitis with a sore throat is usually caused by common viruses, like Influenza virus. Chronic laryngitis, usually caused by long-term smoking or air pollution, often present with chronic bronchitis, is characterized by a chronic cough and spitting up phlegm. Reflux laryngitis with itchy or burning throatmay result from gastroesophageal reflux disease (GERD) or frequent vomiting. Nodules and polyps in the vocal cords are caused by long-term smoking or voice misuse. Ulcers are usually caused by endotracheal tube used during artificial breathing. Vocal cord paresis is caused by injury or pressure upon the laryngeal nerves. Laryngeal carcinoma is mainly caused by long-term smoking and/or alcohol abuse. Laryngomalacia, common in infants, is an immature larynx folding inward during inhaling, therefore obstructing breathing. Presbylarynx is age-related degeneration of larynx tissues resulting in weak voice. Hoarseness can be caused by any of above disorders.